The remains of a calcified ovarian teratoma in the pelvis of the skeleton of a woman from the Roman era confirms the presence in antiquity of this type of tumor - formed by the remains of tissues or organs, which are difficult to locate during the examination of ancient remains. 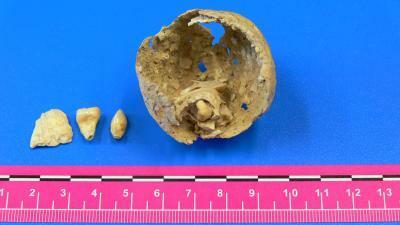 Inside the small round mass, four teeth and a small piece of bone were found. Teratomas are usually benign and contain remains of organic material, such as hair, teeth, bones and other tissues. There are no references in the literature to ovarian teratomas in ancient remains like those found in this study, led by Núria Armentano of the Biological Anthropology Unit of the Universitat Autonoma de Barcelona. Teratomas are asymptomatic in 60% of cases, but on occasion they cause torsions and functional problems in nearby organs, by compression when they are large. Pregnancy seems to favor certain complications in teratomas, such as complications on giving birth. Nevertheless, nowadays they seldom grow large and calcify even less often, because they are detected and operated on very early. The tumor in this instance is rounded in shape, with a wrinkled surface and the same color as the bones, about 43 mm long and 44 mm in diameter. It was found in the right-hand part of the pelvis of a woman of between 30 and 40 years of age and who lived around 1,600 years ago, and came from the Roman cemetery in the archaeological site of La Fogonussa (Lleida). The skeleton was recovered in 2010 during the excavation of 46 graves in La Fogonussa and formed part of a total of 87 skeletons. It was complete and well-preserved, buried in a tile grave. A macroscopic examination and a scan revealed four teeth of anomalous morphology inside the tumor, two of which were adhering to the inside wall of the tumor, and a small bone fragment. "The calcification and preservation of the external walls of this tumour are exceptional, since these types of remains usually only retain the internal structures and the extremely fragile external ones disappear," said Assumpció Malgosa, co-author of the study. There are very few differential diagnoses of pelvic and abdominal calcifications in archaeological contexts, among other reasons because it is so difficult to determine their nature - they could be kidney stones, fibromas, teratomas, arterial remains, etc. They are hard to spot during the excavation and can easily be mistaken for stones. In the case of the Roman woman the researchers do not discount the possibility that the tumor was the cause of death, though this cannot be certain. It is also possible that she lived all her life with the calcified tumor and had no further complications. Published in the International Journal of Paleopathology.